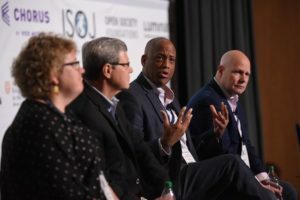 It’s time for the journalism industry to focus on chipping away at the distrust in media, according to panelists at the 20th annual International Symposium on Online Journalism. 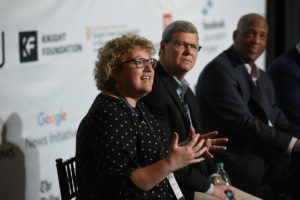 During the panel “Can media really rebuild trust with audiences?” journalists and industry specialists outlined the problems newsrooms are facing and shared ideas for ways to overcome them. Trust in media has dropped by more than half in the past 50 years, said Tom Rosenstiel, chair of the panel and executive director of the American Press Institute. Among other things, he attributed the downfall to the development of technology allowing for more options for news consumption. In addition, Rosenstiel pointed to the deregulation of radio and cable leading to more partisan talk shows. Younger people, he said, report higher rates of distrust in the media because they were raised in this media environment. Partisan journalism veiled as unbiased coverage is one of the main reasons there’s been a decline in trust, said Charlie Sykes, editor-in-chief of The Bulwark. He added it’s time for journalists to begin asking themselves tough questions and to be honest about their own biases. “You don’t think you’re biased, fish don’t think they’re wet,” Sykes said. Publishing and promoting diverse voices and opinions is key to overcoming this issue, said Rob Bennett, the editor-in-chief and general manager of global content operations for Microsoft News. Bennett said Microsoft News focuses on elevating good, diverse journalism rather than just re-sharing what’s popular or performing well. “We really embrace the breadth and depth of journalism,” he added. Another issue facing journalism is that people often confuse news and opinion media, according to Mizell Stewart III, the senior director of talent, partnerships and news strategy with Gannett and the USA TODAY Network. He said that’s understandable when opinion programming takes up more time than news. The public is also apprehensive of the news industry because of a general distrust with the government, Stewart said. He added people are more likely to distrust institutions, like media, when they believe their government isn’t meeting their needs. “Trust in media and trust in government are intertwined,” he said. Stewart and other panelists said “radical transparency” could be one of the ways to rebuild the relationship with readers. But it’s important for the “transparency” to be interesting and not too introspective, said Joy Mayer, the director of Trusting News. For example, she said it’s not enough for journalists just to explain to readers the process of how they scored interviews. Instead, she said it’s important for newsrooms to spend time thinking and formulating ways to explain the journalism process in a way that’s engaging. Newsrooms also need to be paying more attention to their audience’s feedback, especially in the comment sections, she said. Understanding readers’ concerns is crucial for rebuilding the relationship between the media and the public, she added. “Spend enough time with your critics so you know why they mistrust,” Mayer said. Trusting News offers coaching appointments to journalists to help them find ways to rebuild the relationship between their audience and their newsrooms. The organization also has a weekly newsletter with tips on ways to boost trust.